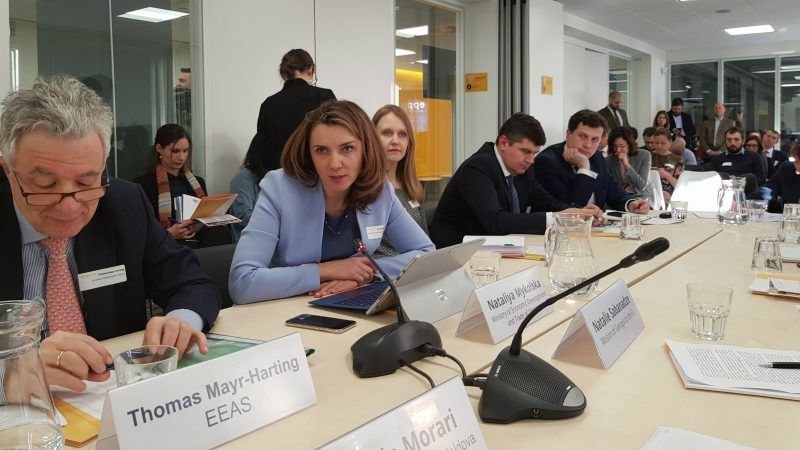 One of the key messages from the EURACTIV debate on the Eastern Partnership – “Georgia, Moldova, Ukraine and the EU: The Road to 2020” held on March 20 in Brussels was that the Deep and Comprehensive Free Trade Agreements with these countries need a revamp. The Deputy Minister for Economic Development and Trade and Trade representative of Ukraine Nataliya Mykolska voiced frustration on how her country was treated by the EU. “The Russian aggression is taking place in addition to the embargo”, she stressed, reminding of the difficult geopolitical situation since her country signed the Association Agreement with the EU in March 2014. In her words, Ukraine is also facing the total transit ban to the Caucasus countries, to Central Asian countries, which greatly affected its exports. Therefore, she argued, the trade relationship with the EU is of vital importance, also for Ukraine’s national security. The Ukrainian Trade Representative described the Eastern Partnership (EaP) as an additional tool for promoting her country’s interest in the region, with countries that have also concluded Association Agreements with the EU and also face trade aggression from the EU, at different levels. The state of play of the EaP, launched in 2009 between the EU and Ukraine, Moldova, Georgia, Armenia, Belarus and Azerbaijan, is that the first countries are seeking close integration and even EU membership for which the EU is not ready, while Belarus and Armenia chose the Russia-led Eurasian Economic Union, and Azerbaijan, rich in fossil fuels, has opted for neither affiliation. Mykolska said that Ukraine was also suffering from rising protectionism around the world. “It is not only protectionism from the US; we also see a number of protectionist initiatives in the EU”, she said. She added that EU protectionism had been a barrier to further integration of Ukraine with the EU market. A recent anti-dumping decision of the Commission treated Ukraine in the same way as countries without DCFTA, she said. “This tendency not only makes us sad, it could be dangerous in the long perspective, and not only for Ukraine, but for other countries that have the aspiration for further integration with the EU.”, the Ukrainian official said. Mykolska said there were also positive signs, the Ukrainian business becoming more integrated in the EU value-added chain thanks to the DCFTA. Every month, new Ukrainian products arrive in the EU markets, and many of them are products which previously were destined for the Russian and CIS market, she said. The Ukrainian official stressed it was high time to examine her country’s trade with the EU for the next 10 years and to make an impact assessment. This is even more important because DCFTA was concluded based on evaluations made in 2007, she argued. Since then, the structure of Ukraine’s economy had totally changed, and many of the sectors which both Ukraine and the EU needed protecting back then no longer need such protection, she explained. As an example, Mykolska said that both sides had been very protectionist towards the automotive sector. But now she said that in Ukraine there were automotive clusters in Ukraine which produce components, cables and electronics used by the EU automotive industry. Most cars produced in the EU use components produced in Ukraine, she said. Mykolska said that Kyiv believes there is a need for an ambitious agenda within the EaP and an assessment should be carried out on a multilateral basis with countries with DCFTAs with the EU. Several speakers, including former Danish Prime Minister and former NATO Secretary General Anders Fogh Rasmussen, who now leads a consultancy and acts as an advisor to the President of Ukraine Petro Poroshenko, stressed the need for the EU to open up to the three EaP frontrunners on the Customs Union, Digital Single Market and the Energy Union. Thomas Mayr-Harting, Managing Director of European External Action Service stated that he was not convinced that the customs union would offer them better conditions that preferential agreements within the free trade agreements they already have. He highlighted that the “EaP is the most ambitious partnership offered to third parties since the enlargement. Lithuanian EPP MEP Laima Andrikienė warned against the EU’s developing “enlargement fatigue”, adding that the Russian appetite for involvement in the region was growing.